Elevated CO2 Makes Onions Larger, More Nutritious and More Pleasant Tasting! Bettoni, M.M., Mogor, A.F., Pauletti, V. and Goicoechea, N. 2017. The interaction between mycorrhizal inoculation, humic acids supply and elevated atmospheric CO2 increases energetic and antioxidant properties and sweetness of yellow onion. Horticulture, Environment, and Biotechnology 58: 432-440. Onion (Allium cepa) is a key global food crop with over 80 million tons produced annually. It is also increasingly recognized for its medicinal properties, which may hold certain benefits for human health (Cheng et al., 2013). Consequently, there is much interest in improving the growth and yield of this important crop; and scientists have begun to examine ways to do just that. One of the latest groups to conduct such a study was that of Bettoni et al. (2017), who investigated the responses of yellow onion (cv. Alfa São Francisco-Cycle VIII) to three growth-influencing variables, including (1) an agronomic effect (with or without application of humic acids), (2) an environmental factor (normal or elevated atmospheric CO2 levels; 360 or 700 ppm, respectively), and (3) a biotic influence (with or without inoculation of mycorrhizal fungi). The onions were all grown from seed and placed in greenhouses under various combinations of the three growth-related factors. And what did their experiment reveal? Mycorrhizal inoculation was shown to have a mixed influence on onion growth, whereas the application of humic acid always enhanced it. However, elevated CO2 appeared to exert the most significant influence of the three variables examined, increasing photosynthetic activity and both the fresh and dry weights of the onion bulbs (see figure below), as well as the bulb concentrations of starch (from 10 to 146%), total soluble sugars (from 48 to 67%), total soluble proteins (from 86 to 293%) and soluble phenolics (from 7 to 30%). These increases in sugars and proteins, according to Bettoni et al., "enhanced the energetic value of [the] onions," while "the increase in phenolics improved their antioxidant properties." In commenting on these several findings, the authors say their results confirm the facts that onion bulb quality and yield can be significantly enhanced by agronomic, environmental and biotic factors, principally by raising the CO2 content of the air, as they observed here. But the end of the good news does not stop there, as the researchers note that elevated CO2 also increased the ratio between soluble solids and total titratable acidity, which increase, they say, "may enhance the perception of sweetness and make onions more pleasant for consumption." What more could one ask from elevated CO2 than to take a simple onion and transform it into a larger, more nutritious and more tasteful vegetable? Oh the wonders of this miracle molecule! Figure 1. 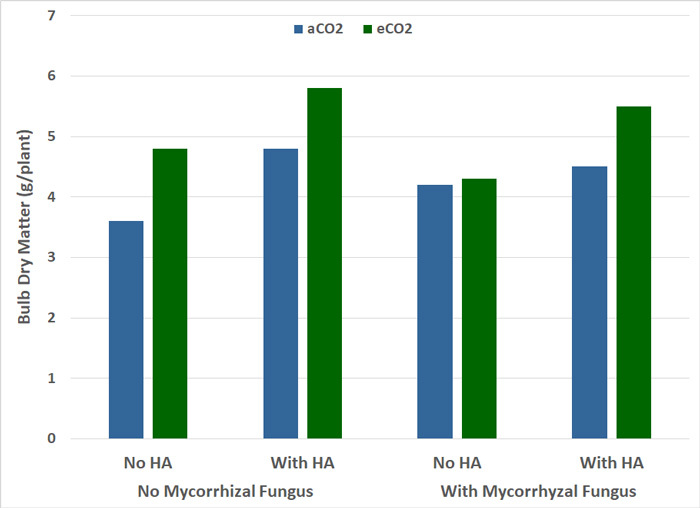 Onion bulb dry matter response to atmospheric CO2 enrichment under various growth conditions, including with or without humic acids (HA) and mycorrhizal fungi inoculation. Legend: aCO2 = ambient CO2 concentration of 360 ppm, eCO2 = elevated CO2 concentration of 700 ppm. Source: Bettoni et al. (2017). Cheng, A., Chen, X., Jin, Q., Wang, W., Shi, J. and Liu, Y. 2013. Comparison of phenolic content and antioxidant capacity of red and yellow onions. Czech Journal of Food Sciences 31: 501-508.